Looking for more useful tips from locals in Paris? Make sure you get yourself copies of our 2019 INSIDR Free Paris Travel Guides! Mais ‘wee wee’, it may not be the first Paris related question that comes to mind, but knowing where you can go and ‘spend a penny’, ‘use the bathroom’ or however you wish to put it, is an important practical question, and we thought we’d answer it for you! Public Toilets in Paris Offline – This app will allow you to find public toilets in Paris, even if you don’t have an internet connection. Luckily, Paris is full of museums and monuments which means there are toilets in abundance that you are free to use! But beware, sometimes Le Louvre has long lines to get inside, not what you need if you’re desperate. However, if it’s your only option, make sure you use the entrance by the Carousel du Louvre, accessible from the Rue de Rivoli or the metro “Palais Royal – Musée du Louvre, as the lines tend to be shorter! The toilet is inside the gardens near the corner of rue de Rivoli and the place de la Concorde (1st arrondissement). The modern art museum has a public toilet on the entrance level that you can access without buying a ticket (3rd arrondissement). The public toilet is located outside and south of the cathedral — follow the signs to the “WC” (4th arrondissement). The “grey lady” has thoughtfully placed a toilet between her legs. It’s on the right side if you’re looking from the Champs de Mars (7th arrondissement). The freestanding public toilet is located outside and just southwest of the basilica (18th arrondissement). 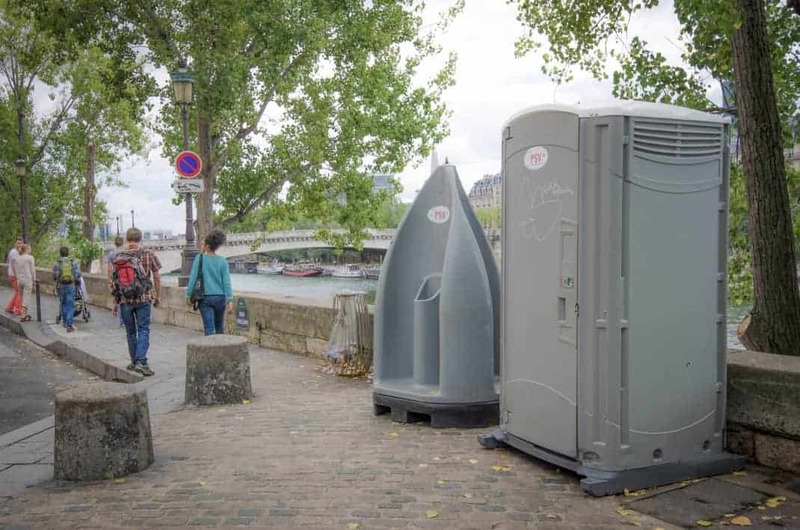 Paris has more than 400 public toilets, called sanisettes, located on the public footpaths around Paris. They are free to use and all have disabled access. Many of the sanisettes are open 24hours a day, others are open between 6am- 1am. They are automatically cleaned after each usage. You can check out this map which will locate all the sanisettes in Paris so you can find one near you! Toilets can often be found in metro stations. Granted, they won’t be the most glamorous, but can be very practical! Heads up, sometimes you will need to have a valid ticket to be able to access them as they are beyond the barriers! If you want to avoid paying for something in a café in order to use the facilities, you could try a big restaurant chain or coffee shop, such as Starbucks, KFC, McDonalds etc. However, be warned, sometimes you need a receipt which has a code on it to allow you into the bathrooms. It’s pot luck with this though, not all places require the code! In 95 of Paris’ parks and gardens, you will find free toilets during opening times (they close either at sunset or dusk). Many department stores in Paris have bathrooms you can use, the more luxurious stores may require you to pay, but others are completely free. Toilets in railway stations and department stores are commonly staffed by attendants who will expect a small tip. If you need to use a café or restaurants facilities, it is courteous to buy something. Many brasserie restrooms need a coin to unlock the door (if you don’t have one as the server for a jeton).